Library is a regularly scheduled class. Students are taught to use the library in connection with classroom work and to read for leisure. The school library books are to be used only for library research in the library. Students are welcomed to use the library. During class time and “resource periods,” individuals and groups (may visit the library with a teacher’s pass). Students should stamp their passes in the time clock and sign in when arriving and sign out when returning to class. Students are expected to make prompt replacement of damaged or defaced items so that the library collection can be maintained for the use of all students and staff. Just Kids Centers Preschool and Academy literature program exposes students to a number of different assignments. They will read the literature selections and novels appropriate for their grade level. A variety of additional readings in class and for homework activities will allow the students to make reading a daily occurrence. The students may present his or her proof of understanding orally, in writing or by using a media presentation. At other times, students may role-play a character in a literature selection. Reading is a simple word that describes a series of interrelated thinking and learning processes that occur simultaneously to interpret symbols on the printed page. The typical classroom consists of students who have different levels of reading and a broad range of interests. All students, including those whose primary language is one other than English will have access to challenging and thought-provoking reading material and Literature. 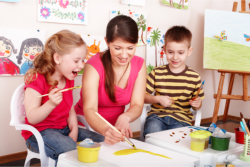 The art curriculum at Just Kids Centers Preschool and Academy Schools is structured to meet the variety of student interests and needs as they relate to visual arts. This curriculum guides students K-5 grades through the basics of art with fun and educational projects they are sure to enjoy. Multiple techniques such as paints, crayons, paper, wood, fabric, clay, and organic material are used in Art class. The emphasis is on developmental creativity utilizing not only two-dimensional but also spatial awareness. The curriculum guides students through the basic drawing techniques and to view objects with an artistic outlook. Those students expressing artistic talent will also benefit from this course by improving their techniques with skill and practice. Identify the three primary colors and combing of primary and secondary colors. Recognize different kinds of lines. Identify movement or rhythm in Art. Learn the importance of having a center of interest in their artwork. Demonstrate an awareness of music as a part of everyday life. Demonstrate the knowledge that people have made music throughout history. Improve basic skills in Reading and Phonics, Writing and Spelling and Mathematics. Learn and apply general computer skills. Work independently using Just Kids Centers Preschool and Academy own advanced courses K-5 in the virtual education setting. Learn and apply research skills as well as prepare reports and projects. Computers are essential tools for learning. Just Kids Centers Preschool and Academy Schools are equipped with Computer Labs and technology to provide students with the most modem access to knowledge in the secure Internet surfing. Troubleshooting: To help to correct common errors made in writing. Resources and Skills needed for research writing. Study Skills: Students are taught how to study by organizing, out-lining and preparing information for future use and recollection. K- 5th graders’ introduction to Computers for Windows brings the novice into the “Information Age” in a “low impact “methodical format. Hardware, the keyboard, terminology, and the Windows desktop are covered extensively. Students learn to copy and paste, from one program to the other. They learn to recognize and use the basic windows screen landmarks. Microsoft Office and Internet: Students take the “next step” in their favorite application such as Word, Access, Power Point, Excel, Publisher or Internet. They will learn useful tools for preparing successful reports and projects in other classes. Eating, drinking or playing of computer games are not allowed in Computer Lab. Students log on and off from computer systems correctly. Only software provided by Just Kids Centers Preschool and Academy is permitted. The use of particular discs is not allowed. P.E. is the education in the care and development of the human body including the athletic aspects and hygiene. One of the recommended components of health care is regular physical activities. It also teaches the basic of team sports. Practice locomotion and non-locomotion movements.